How do you like the speakers and the sub? I was very tempted by the Axiom Epic60's but ended up with the Energy RC's (which I love) thanks to some absurd mispricing by FutureShop (they were well <25% of msrp). As I was walking out to the truck with all 7 huge boxes staked on their flat-deck-cart I kept expecting someone to come running out to say they'd found out the mistake... never did. The SVS subs have a great reputation, but I have to admit I've never heard one live. Would you recommend them? Looks like we were typing at the same time, haha. Thanks for the screen material idea, and note on the 'wife acceptence factor' on the sub; something I have to always pay attention to as well. Would love to hear more on the speakers. All-in-all nothing special. Need to stop moving into small condos to really justify upgrading. That's not really the intention of surround sound subs. If you want ground shaking bass, set up a car sub. The surround sound subs are to flesh out the sound. Build a corner shelf right above the tv. Very happy with the purchases overall. The speakers are very nice, I never feel like they're harsh no matter how loud I go. The sub.. it kicks, I've got a very large room to put it in (something like 6000 or 8000 cubic feet, can't remember) and it's actually made me jump thinking something fell and hit the house a few times, but still sounds good too. I really haven't had time to tweak it out though (go in with a sound meter , play around with the sub position and all that stuff), so it could all probably be better as well. Speakers: Klipsch Reference: Fronts-RF82's, Centre-RC62's, Sides-RS42's, Rears-RB61's. 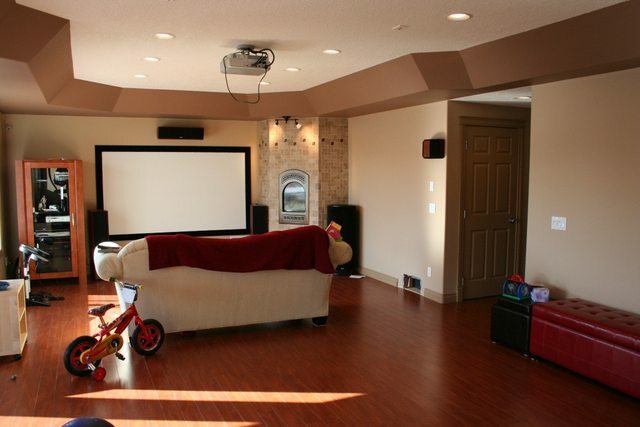 Room: completely open and pointless for home theatre. Working on changing that too. Open to ideas. Just built a riser for 2 more make shift recliner chairs (2 pieces of a sectional just pushed together) So now my room sits 6 instead of 4. Also have the rear surrounds set up. Not sure if they are placed right and am waiting patiently for my mono price shipment to come in so I can wire the rest and fix my shelving. Does anyone have a cheap fix for IR extending? I have a set up in my small computer room. My computer has a 8800GT feeding my two monitors and a HD5670 feeding my LG 37"LH40 TV and the HDTV in the living room. I use it for streaming shows from the net. I also have a Bell 9242 receiver with Centre Ice and my laptop feeding both TVs. I also have two other Bell HD boxes and one SD box. For audio, I cheaped out and bought a Onkyo system in a box. I was considering the top Logitec computer audio system but I think the Onkyo has more connections. Like I said it's a small room, so a better system maybe isn't needed but I might upgrade it with a new 3D receiver and send this receiver to the living room to replace an old Kenwood. One thing I've noticed, the compulsion to upgrade never dies. Last edited by Vulcan; 03-27-2010 at 06:25 PM. Got some pictures from early on before everything was done, but gives you an idea. Yes that black cylinder on the right is the sub. That looks damn good Photon. Have some nice curtains to block out that light? Yeah eventually bought some blackout blinds from blinds.ca.. still more light than I'd like, would need drapes to really make it black during the day (south facing walkout basement with a wall of windows is on the left there), but it's dark enough to play games or watch a movie so it's fine. I like your setup. I'll have to snap a picture of mine soon here. I'm impressed you were able to mount your projector so close to the ceiling and still shift it down to the screen. The furthest shift down mine would do has the lens about equal to the top of my screen. 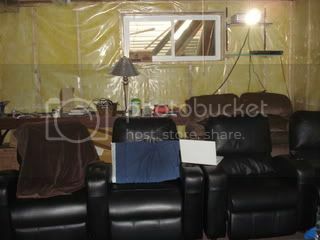 I only have 7 foot ceilings in the basement though, so it didnt cause any issues. My issue was actually finding a super low profile projector mount so i wouldn't hit my head! Ended up with this one below from Peerless which has worm-gears for pitch, roll, and twists in place too. Made setup a snap. Remarkably I have my wife on board for an SVS sub in conversations this weekend (love you dear). Showed her pictures and she thinks the cylinders are cute --I'll take it. Nice use of space Thor. Where'd ya get that coffee table? I'm impressed you were able to mount your projector so close to the ceiling and still shift it down to the screen. The furthest shift down mine would do has the lens about equal to the top of my screen. Yeah I had to work out all the angles and stuff before I bought anything, to make sure that my screen size, projector drop, and lens shift would all work out. The Z5 has a really great lens shift, though I'm almost at the end of it, if my projector was off-center more than a foot it wouldn't work. Though something must have happened because the image is tilted and not all the way down now, so I have to unmount it and re-do it, what a PITA. 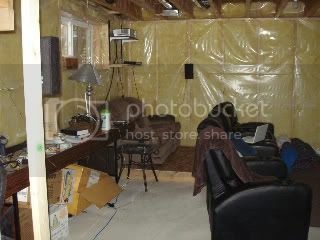 I only have 7 foot ceilings in the basement though, so it didnt cause any issues. My issue was actually finding a super low profile projector mount so i wouldn't hit my head! Heh, we did 9 foot ceilings in the basement when we built. The bulkhead that goes around actually goes all the way around that room in the basement, the reason was to hide the pipes and heating on the top right of the picture, but instead of having something square and plain, I decided to work with it and extended it all around the room, put in the corner details, and painted it darker to pop. It looks awesome I think. Ended up with this one below from Peerless which has worm-gears for pitch, roll, and twists in place too. Made setup a snap. Hmm, I might have to look into that if my readjustment of my projector doesn't go well. Do you have a shot of the bar Thor? Just wondering what it's like, we haven't put anything like that in yet. Actually that was the Brick believe it or not. The cherry cabinets are from IKEA, very good price. Thinking about going from a 50" plasma to a projector. Anyone used/checked out a 3D one yet? I believe BenQ has one out now. It's 720p, but I doubt I need 1080p. I do mostly gaming and little movies. 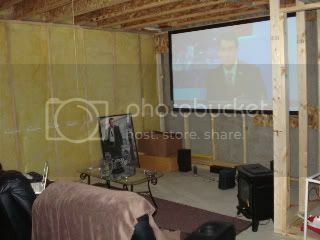 My "theater" is in the basement (which I developed myself) and is about 35 x 25. I was smart for once and planned out the room well in advance, so there is dedicated power and all of the speaker wire is in the wall. I decided to mount the speakers about 5.5 feet up the wall because I have a 2 year old that loves to poke things. I am really happy with the KEF speakers and sub. The price wasn't crazy but the sounds is great. The H/K receiver is starting to get a little long in the tooth, although it is still going strong. Just the complete lack of hdmi ports and newer technologies is annoying.